* Laser engraved 5 Speed Design. 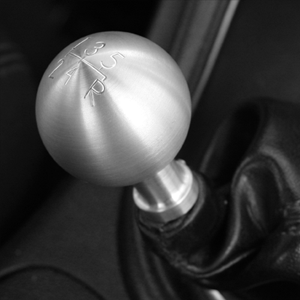 Innovative Bold Styling: Eliminate that Unsightly factory shift knob and move up to our Original Bullitt Mach 1 Style Billet Shifter Knob. Quality Construction: Crafted to fit & function better than an OEM part. No one else can Stack up to the bold clean styling of our aftermarket Billet / Stainless Steel Dress Ups, Street / Strip / Racing Suspension and Performance Parts for your American Muscle Car! All our Custom Billet Shifter Knobs come with all hardware required for a clean easy install in under five minutes for a Bold new look. Click Here for Instructions Fits these Vehicles: 2005 2006 2007 2008 2009 2010 GT Mustang Roush Saleen & Vehicles. 2005 2006 2007 2008 2009 Shelby GT500 (does not fit 2010+ GT500) Made in the USA!